Yes, I know. I have recently made a mini goat cheese cheesecake recipe and this is indeed one more. I can’t help myself. There is something about the complex and unexpected tang of goat cheese in a cheesecake that fascinates me. I promise this will be the last one. At least this month week. I am not the only one in my house that has an obsession with goat cheese. The other morning my sister and I went out with our friend Michelle for a little breakfast date and I ordered the Baby a bagel and cream cheese. She looked at the cream cheese, took a bite and said, ‘mmm, it tastes kind of like goat cheese’. Yes, my three-year-old loves goat cheese. I love that about her. For me, pumpkin pie is a must have at a Thanksgiving table. That being said, I have to be completely honest – I don’t actually love the stuff very much. It’s okay. 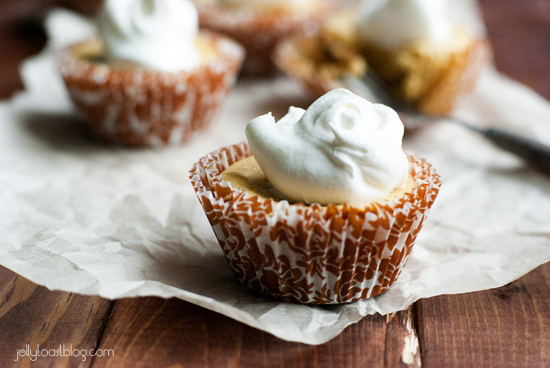 My grandma makes awesome pumpkin pie and I love the pumpkin flavor, but for some reason I am always looking for a little something different in my pumpkin dessert. I get all excited inside when I see a pumpkin trifle or some kind of pumpkin cake. It’s the traditional pumpkin, with a little something extra. With the goat cheese and gingersnap crust, these little pumpkin goat cheese cheesecakes are my ideal Thanksgiving dessert. Like little amped up pumpkin pies. 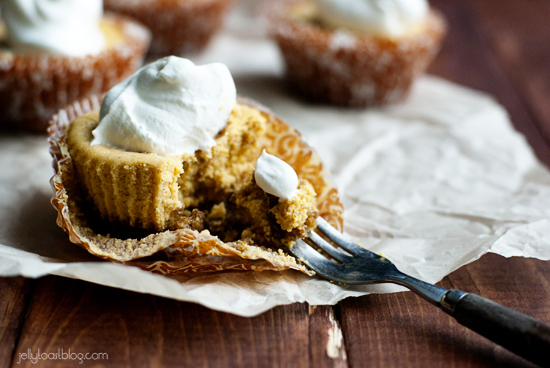 Amped up pumpkin pies that I can eat four of in one sitting without missing a beat. It’s kind of a problem. Line 18 muffin tins with paper liners and set aside. In a small bowl, mix ginger snap crumbs, ¼ cup+2 Tablespoons sugar and melted butter until crumbs and sugar are moistened. 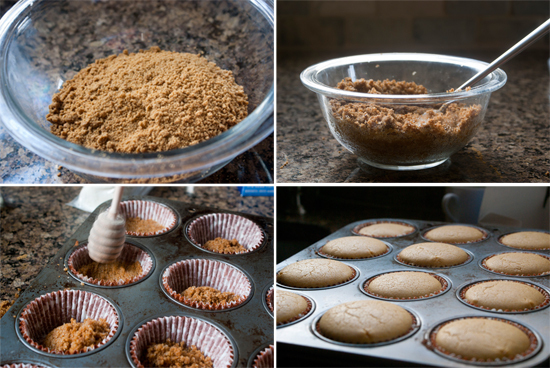 Divide the crumb mixture evenly between the paper muffin liners (about 1 Tablespoon per liner). Press the crumbs down with fingers or honey drizzler. Bake for 5 minutes and remove from oven. In the bowl of an electric mixer, beat cheese and sugar together. Add pumpkin and beat until incorporated. Add pumpkin pie spice and vanilla and beat for 30 seconds. Add eggs, 1 at a time and beat well after each one. 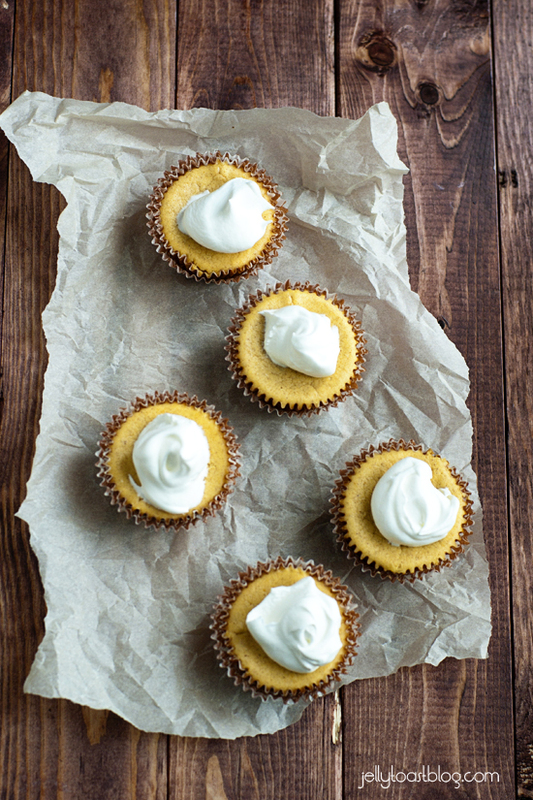 Divide cream cheese mixture evenly between muffin liners. The cups will be pretty full. Bake the cheesecakes for 15-17 minutes or until the edges of the cheesecakes are set, and the center is still a little wiggly. Be careful not to over bake them. Remove from oven and let cool. Cover and refrigerate for 4 hours or overnight to allow the cheesecakes to completely set. Top with whipped cream and serve. Enjoy! That’s a good question and one that I’m not entirely sure of the answer (simply because I have never done it myself). I tend to use a combination of half goat cheese/half cream cheese to avoid the dessert being overly tangy/savory (although I love the hint of tang that comes with using this ratio). A quick Google search shows that there are recipes out there that use 100% goat cheese, so I would think that it would work, but can’t guarantee what the results are like. I would think with your allergy that it would be a great thing to try. These are adorable!!! Pumpkin and goat cheese are two of my favorite things; combining them is pure genius. Can’t wait to make these! Just made these. They’re cooling as I type and they smell sooooo good! Thanks so much for sharing your recipe.